Freetown, Aug 16 (IANS) At least 400 people have been confirmed dead and 600 people are still missing following a mudslide and flooding in the Sierra Leone capital, officials said on Wednesday. President Ernest Bai Koroma declared seven days of mourning while pleading for “urgent support”. According to a statement from the Office of the President, the national mourning will be observed from August 16 till August 22, during which all flags would be flown at half mast, BBC reported. 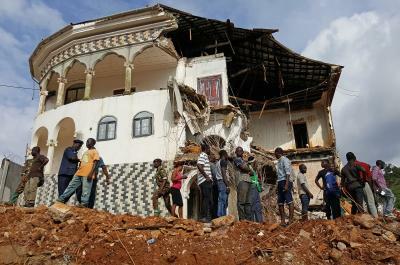 Nearly 400 people were confirmed dead after the mudslide in the Regent area and floods elsewhere in Freetown on Monday. The Red Cross warned it is a race against time to find survivors. Presidential spokesman Abdulai Baraytay told the BBC that bodies were still being pulled from the mud and rubble. A planned a mass burial of victims on Wednesday to free up space in mortuaries was delayed, the report said. Rescue workers described the situation as “chaotic”. Abu Bakarr Tarawallie, a Red Cross official, said rescuers were “racing against time, more flooding and the risk of disease to help these affected communities survive and cope with their loss”. The British International Development Secretary Priti Patel said the UK already had “pre-positioned vital aid supplies” in Sierra Leone, while the UN said its local teams had mobilised and were supporting rescue efforts. “Contingency plans are being put in place to mitigate any potential outbreak of waterborne diseases such as cholera, typhoid and diarrhoea,” UN spokesman Stephane Dujarric said. 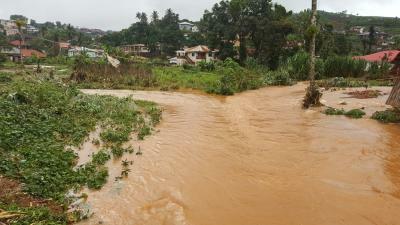 Homes in the hilltop community of Regent were engulfed after a part of Sugar Loaf mountain collapsed following heavy rain early on Monday. Many victims were asleep in bed when disaster struck. President Koroma fought back tears as he toured Regent on Tuesday and said the devastation was “overwhelming us”. “Entire communities have been wiped out. We need urgent support now,” he said. He urged people to stay away from the affected areas. 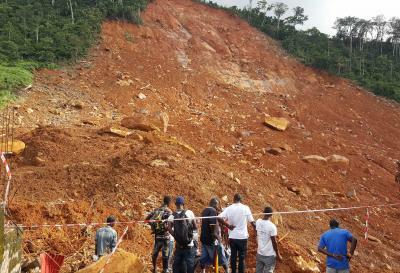 Deputy Minister of Information and Communication Cornnelius Deveaux said the search to identify corpses and possible survivors was still in progress as hundreds more were feared to remain missing after the mudslide hit.